congratulations to the smoke ring, the local establishment that had the honor of hosting our inaugural NRW tradition! this cozy spot in the castleberry hill neighborhood of atlanta sparked our interest when we checked out their menu online. the eats looked intriguing and comfy, soulful and hearty, descriptors that should be no stranger to a southern dish. so, that is the owner’s idea on the restaurant. but what about our idea, the critics’ take? the people’s opinion? i know you want the goods on the food, but let’s start by talking atmosphere. if you live in a big city, you know that getting around and getting to a place is half the battle. so first, the smoke ring conveniently has a free, covered parking deck that shares its building. secondly, they take reservations in advance, which is quite handy for larger groups. speaking of larger groups, do not fear, because they will gladly issue separate checks. swing through the double-doors in the front of the restaurant, and you will find yourself in a lofty, new-age space. one of our diners even dared to describe the smoke ring as country-chic. i’m thinking a masculine country-chic… you can find out for yourself when you go. the chairs are not cramped, and the tables are large for your party. the dining space does not feel so enormous that you feel like you won’t be seen by the staff, but it isn’t too small that you won’t get to enjoy your meal or the company of those around you. the hostess gladly seated us at our reserved table, right in the front of the restaurant. only the best for this crew. then our friendly and attentive waiter got things started. where shall we begin, you ask? I think the drinks and appetizers are a good place. 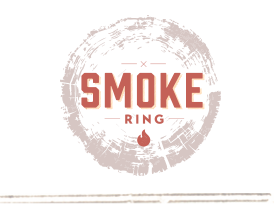 as far as drinks, the smoke ring offers your standard non-alcoholic options, one of which is their very sweet tea. if sweet tea flows through your veins, order yourself a big ol’ glass when you come. other folks ventured to the adult beverages, including signature drinks and beers. the cocktails were crafty and adventurous, and the beer menu included carefully picked domestic brews that provided for a good variety, somewhat above your standard selection. i highly recommend you come to the smoke ring with an appetite. if you are like me at all, your eyes will be bigger than your stomach, and we all know how that ends. the food here is filling, and they do not skimp on the portion sizes. our table started the evening with an order of pig sty nachos. now, although they may not sound appealing, they are DIVINE. they have waffle fries topped with pulled pork, queso, pico, sour cream, and so much more. one plate will work for a group from 4-8 people, but if your friends are hungry, maybe order two for everyone to enjoy. so now let’s talk about the main courses. we’ll work the table clockwise from where i was sitting. from our waiter, i ordered the farmer’s daughter, which includes two fried-green tomato sliders and hand-cut french fries. although that may not sound like a lot of food, it was plenty the sliders included pimento cheese and pepper jam atop mini sweet rolls. again, they were delicious, but the amount of sweet stuff on that roll was almost too much for me to handle. i could barely finish one! nathan, who so kindly devoured my second slider when i could not finish it, had a pork plate that was enjoyable. alison tried the chicken salad sandwich and creamed corn, both of which she said were tasty enough to get again. kari and kyle both had the pork as well, with kyle also giving the brisket a try. the brisket is nothing to write home about from what i have been told, but the macaroni and cheese was spicy and delicious. kyle is also a self-proclaimed brunswick stew lover, and he said the brunswick stew here at the smoke ring was worth two thumbs up. jamie liked the smoke ring burger she ordered but loved the brussels sprouts even more. sarah order the underbelly sliders and was hungry enough to gobble them both right up. among the different sauces the smoke rings makes for its guests, the red sauce was worthy of consumption, the mayonnaise-based white sauce was so-so, and the guinness sauce was just alright. all-in-all, the smoke ring was a wonderful host and start to the NRW tradition. the cool thing about this place is that, if you order right, you can get out of there for under $15.00, which is not too bad at all. thank you, the smoke ring, for bringing us good, southern cooking with a bit of a unique twist. thank you for opening your doors to hungry explorers like us.